One would hardly call them birds of a feather, but thrill-seeking American adventuress Beryl Helliwell and quietly reserved Brit Edwina Davenport do one thing very well together–solve murders . . . So when the local vicar–and pigeon-racing club president–approaches them with a private inquiry opportunity, the ladies eagerly accept. There’s been a spot of bother: the treasurer has absconded with the club’s funds and several prized birds. Beryl and Edwina hope to flush out the missing man by checking his boardinghouse and place of employment at the coal mine. But when they visit the man’s loft, they find their elusive quarry lying in white feathers and a pool of crimson blood, stabbed to death–the only witnesses cooing mournfully. After a stiff gin fizz, the ladies resume their search for the missing funds and prized birds–and now a murderer. Beryl and Edwina aren’t shy about ruffling a few feathers as they home in on their suspects. But they had better find the killer fast, before their sleuthing career is cut short . . . 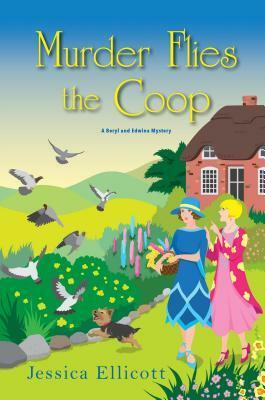 Murder Flies the Coop by Jessica Ellicott is a charming mystery. The characters are older single women. Both very much independent on their own. They like their freedom. Especially, Beryl. She is much more daring and bolder than her best friend Edwina. Edwina brings more of a sophisticated style to their friendship. Her ways of socializing helps out when questioning people. Both ladies have to rely on making their own fortune. In this case, it is dwindling until a pastor comes to them with a problem. It is then, that both ladies delve deep into the world of sleuthing. I found it very similar to Murder She Wrote, Miss Fisher, and a little bit like the famous Poirot. There was plenty of humor, mystery, and action to enjoy.